I had the opportunity last night to take part in Lectio Divina, (translation: Sacred Reading) with a group of other women. Lectio Divina is a way of praying with scripture by reading it three times aloud, slowly and prayerfully. The first time, listening for any word, phrase, or image that stands out for me. The second time, listening for any parallels in my own life or what feelings it stirs up it me. The third time, listening for what the Lord is trying to say to me and determining my response is to that. We focused on the passage, the Parable of The Good Samaritan. Like many of the parables, this one is very familiar to me but as I read it I was startled by the images that stood out for me. I read it aloud all three times and I could see the story unfolding on the pages in front of me. I knew our discussion was to focus on the topic of “who is my neighbor” and how it isn’t just a matter of reaching out to strangers but also to those closest to us. There was an excellent discussion and our sharing was very fruitful, but the images that I am still drinking in were very different. This poor traveler gets jumped, mugged, beat up, and left for dead. The priest and the Levite don’t want to deal with the ritual cleansing they would have to go through if they attended to his wounds so they just keep walking, pretending not to notice. Then this foreigner comes along and takes over. He administers first aid and takes the traveler to an inn and essentially nurses him back to health. 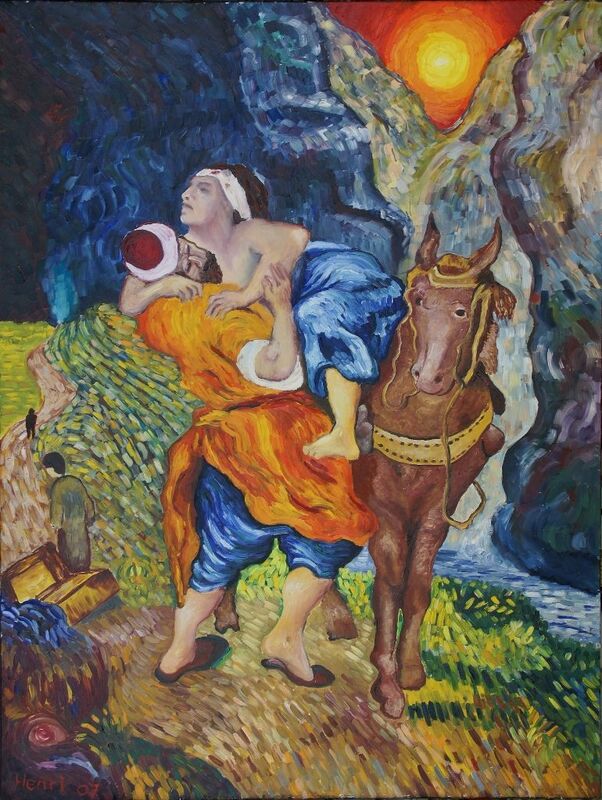 As I read this story that I’ve known since childhood, I realized for the first time that the Samaritan did not nurse the victim back to health. He bound up the worst of his wounds and found him a place of relative safety. He provided monetary support for his care and went on with his journey. The Samaritan didn’t hang around indefinitely. He went on with his life. There have been many times in my life where I have felt an overwhelming need to rescue someone, only to have that relationship drain me almost completely. Why? Because instead of binding the immediate wounds and helping the individual find a place of safety, I would stay on trying to heal wounds I had not inflicted and could not truly understand. Everyone’s place of safety is different. Some just need to be heard. Some need a little money to get on their feet. Some need to be reassured. Some need a way to reconnect with family or friends. Rarely, but most importantly, some need professional help. Those were the relationships that became most unhealthy and even dangerous. But I had always seen it as my good Christian duty to bring these desperate people back to health. Having read and re-read this parable the last day and a half, I have come to realize that God didn’t call me to save people. He sent Jesus to do that. He called me to offer a hand of support and friendship to those in need, but not to lose myself completely in their problems. I can help someone to the inn, offer prayers in support, and go on my way trusting the Innkeeper to take care of nursing them back to health in His time and by His methods.